Some times, all you need is to know how to laugh at yourself or atleast on the situation you find yourself in. Afterall , without some humor this life would be so damn dull and hard to live through. 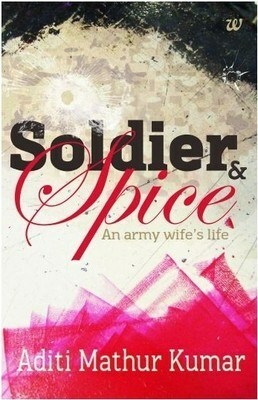 Aditi seems to know better.She knows how to make the readers laugh too on her life as an army wife. From page one , you see the different worlds that are about to collide and have a sense of the cliched situations but nothing will prepare you for the adventure Aditi pens down in the book. This book has people from different cultures and ideas coming together as one family that has to move together if they have to function well and not be bogged down with all the harsh situations they face sooner or later. It also gives us an idea of the life our soldiers live and hownit also affects their families , in both good and not so good ways. The love , friendships and the loyalties portrayed in the book are much endearing and honest too. I have been reading Aditi's blog from some time and I always find it as sensible and witty as her first book. This book has all spices sprinkled appropriately throughout the book and some womderful life lessons too. i have laughed insanely while reading this book and would be eagery awaiting her next book. Angels and Demons by Dan Brown. #BookMemory : A memorable BOOK sale !